Carving through wave after wave of endless undead has proven to be popular with gamers around the world, as seen by the wildly successful Call of Duty games and their obligatory Zombie modes included in almost every entry since 2008. There’s something about tearing through evil shambling corpses that proves to be endlessly entertaining and more than a little cathartic. Blood Waves tries its best to capitalize off the popularity of the zombie shooter sub-genre, but ultimately proves to be as soulless as the zombies it features and will leave the player equally dead inside. 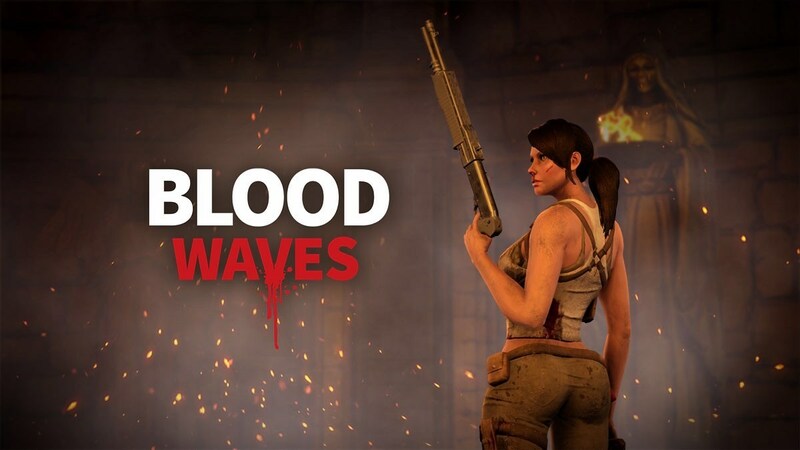 In Blood Waves, players assume the role of a nameless Lara Croft-looking character trying to survive wave after wave of goofy zombies that desire nothing more than to strip the flesh from her bones. To survive, players will need to make use of the various weapons and traps available in the game’s shop area to repel the legions of enemies. Picking up items dropped by defeated zombies, such as bonus money and invulnerability, will further increase your chances of survival. Spend your money wisely, set up your traps, and prepare to die. Where to begin with this train wreck of a game? Firstly, the game’s shooting is some of the wonkiest around. I’ve played enough third-person shooters that landing a headshot on enemies, especially ones that rush straight towards you, is as natural as breathing – yet somehow Blood Waves manages to make pulling off headshots one of the most difficult things in the game, even at close range. The recoil on weapons, even the initial pistol you receive, is comically exaggerated and sends the reticle flying upwards with every shot. It pretty much guarantees that you’ll have to readjust your aim with every shot you take. It doesn’t help matters that the aiming reticle is a small white dot instead of a colored crosshair of some kind. It can be very difficult to see when playing the game docked while sitting on the couch. The awful recoil alone is already more horrifying than any zombie, but the abysmal amounts of damage the weapons do makes them a true nightmare. The shotgun is less like a shotgun and more like a sniper rifle. It has infinite range and no bullet spread. The shotgun in the original Doom was similar and proved to be one of the best weapons in the game for clearing out zombie space marines, mainly because of its one hit kill power. The shotgun in Blood Waves on the other hand, won’t kill a zombie in a single hit even if you shoot it in the chest at point-blank range. The SMG takes so many shots to get a kill and has so much recoil that it can take a full clip just to finish a single zombie. The sniper rifle is weak and completely loses all worth when every weapon in the game has infinite range. Essentially, the problems with the gunplay are endless. Luckily, there are still 5 different traps you can rely on: flamethrowers, turrets, wooden barricades, chainsaw towers, and spiky rolling pins. You can place them however you want before each enemy wave. The game encourages you to set up barricades to protect your flamethrowers and turrets from the undead, and use chainsaw towers and rolling pins to cut down zombies that run at them. You have to be careful though, as there are special zombies that can even destroy your chainsaw and rolling pin traps, such as the acid spitting and exploding zombies. It’s a useless waste of stamina that I forgot it was even an ability until I accidentally pressed Y. The dodge roll makes you invulnerable to damage during the roll animation, but the stamina cost isn’t worth it. It covers less ground than just sprinting in the same direction and if you’re sprinting the roll actually slows you down. Also worth noting is the game’s worthless “repair” feature. For a price lower than buying a new trap, the game lets you repair placed traps that have been harmed by zombies. Between enemy waves, harmed traps will have a repair symbol above them. Simply walk over to one and press the B button to pay for their repairs – but wait, the B button is also the same one you use to start the next enemy wave. There’s no way the game would prioritize starting the next enemy wave over repairing a trap when both options are on the screen at the same time, right? Wrong. I’ve tried every other button in the game, I’ve tried holding B to repair the traps instead of starting the next enemy wave, and no matter what I do I cannot repair a single trap and always get forced into starting another fight with nearly broken traps. It’s one of the most substantial oversights I’ve ever seen, and it makes later waves, where frugality is key to survival, nearly impossible to survive. Visually, Blood Waves has impressive blood spatter effects… and the compliments end there. The pyramid looking arena is generic and is the only area in the entire game. Zombies consist of the same few character models recycled over and over. In fact, the acid spitting zombie is just a modified version of the protagonist’s character model! The music, consisting of the same uninspired hard rock song playing over and over each wave, is terrible and begs for you to go into the options menu and switch it off. Listening to the repetitive zombie grunts is better than that… on second thought, just mute the game entirely. Blood Waves is a bloated corpse of a game floating in a sea of much better experiences. Other zombie shooters such as Left 4 Dead and Killing Floor contain all the small positives Blood Waves has to offer as well as everything it’s so sorely lacking: local and online multiplayer, multiple areas, competent gunplay, varied enemies, good music, a plot, and main characters that aren’t generic Tomb Raider rip-offs. This is one game that’s best left to rot in its grave.